Tim Mossman’s L339 Zenith Blue ’67 Beetle is outstanding. With all original paint, there were some revelations to come that, once unraveled, have proven to be much more than “interesting”. Eric copied to me and I copied to researching friend, Louis Harris in Dallas, Texas. Lou has done much digging through the annals of VW History for me over the years. He’s a computer person. He’s just the one that I needed! Indeed, within hours, Lou had answers. The crayon markings are known as “M Codes”. Take a look at the crayon markings inside Tim’s trunk. The numeral 8 to the right of 27.47 remains unknown. 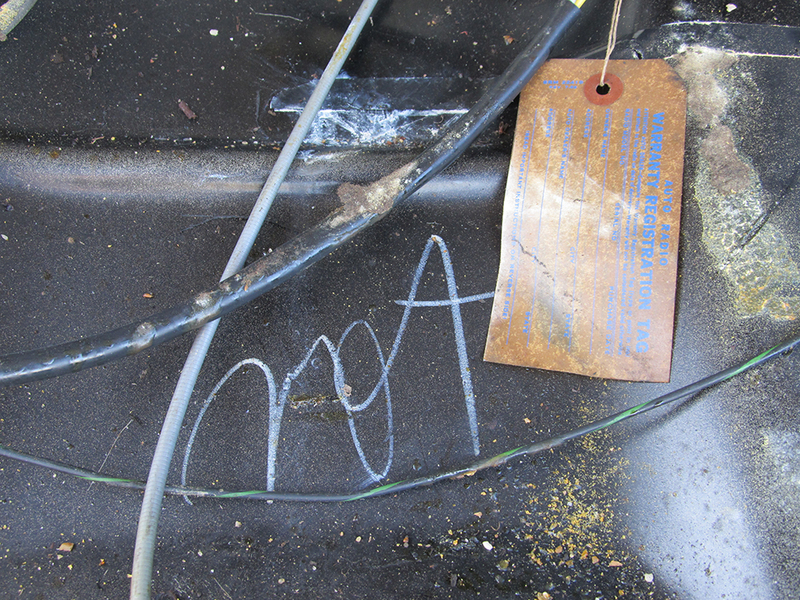 Although some markings are not clearly identified, thanks to Tim and the previous owners of Tim’s car who preserved these markings, we have yet another glimpse into some of the daily assignments at Wolfsburg. Some of you are going to begin looking into your cars for similar markings. Let the readers at 1967beetle.com know what you find. Your comments will be valuable to all of us for history’s sake and for practicality. Many thanks to Everett Barnes of www.thesamba.com for his careful attention to detail and conservation of myriad technical aspects of Volkswagens. Learn more about M Codes. ADMIN NOTE: No problem, Jay. I’ve made the edit. Big Thank You for the article on Tim Mossmans L339. I recently purchased a L282 67 from the original owner delivered in San Diego. 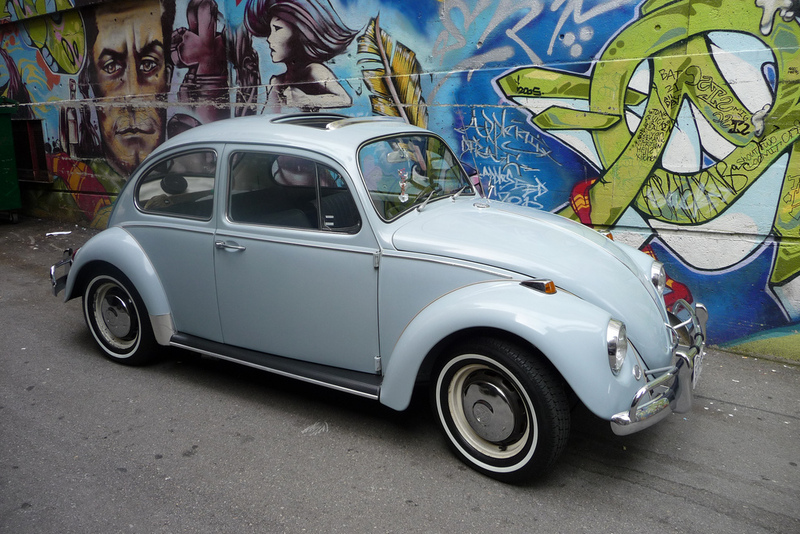 The car is very original, matching #s, origianl motor and was well maintained for its 46 years. engine compartment are original. 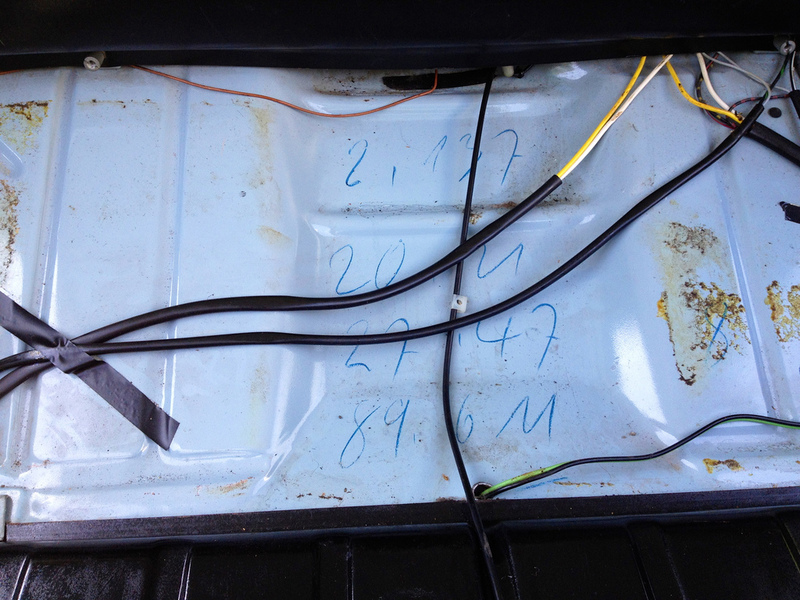 Upon removing the old falling apart trunk liner found markings similar to Tim’s and thought some mechanic along the way had placed the markings in the trunk. I had no idea the mechanic was on the manufacturing line in Germany. will definitely be leaving them now after reading your article. Eric Thank You For Your Site – Very Helpful – Keep up the Great Work. Thanks, this is awesome. 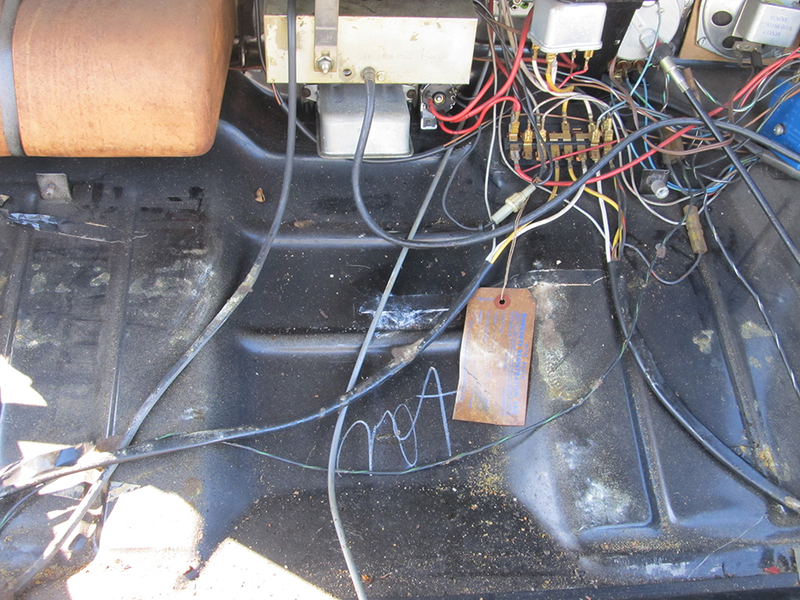 I’ve also noticed grease pen/crayon markings (in red) on the door panel inner skin on Felix the Beetle, and darned if it doesn’t look like the same handwriting. Anyone else noticed those? Thanks, Marius! Jay gets all the credit, of course. The “M” codes referred to factory-fitted optional equipment on our VW’s, but why the letter M? In German, the word “extra” translates as mehr, hence the “M” code. That is your German lesson for the day. As for M codes on my 67, mine has a code of M350 which covers all of the USA equipment that is listed separately on Tim Mossman’s car. I wonder at what point M350 superseded the individual numbers. I also have M93 for hinged quarter windows. This is so cool! I dig it! Thank-you Jay for writing this up! I too have some mysterious crayon markings on my car. However, I suspect they originated from my granddaughter rather than the factory. I had to chuckle over the “strange markings on your Beetle”! But, of course, you are going to leave them, aren’t you? They should furnish a subsequent owner with some head-scratching as he attempts to learn their values from the M-Code Charts! Think about it! Hmmmmm! I’m stumped. This is a great article. In segment 2- “markings”- One of the responders, Jody, correctly mentions that “M” stands for “mehr” (rhymes with “rare”) in German. Since I worked at Volkswagenwerk in the early ’80’s (offices, not the production line) and this abbreviation was commonplace, the actual full word is “Mehrausstattung”- additional equipment. Great to see such a well-preserved ’67! My ’77 std. Beetle bahama blue metallic (dormant project) also has some crayon markings, these in the front wheelwell.